8 hours until the corn and pork are tender. Add the prawns, lime zest and juice and cook for a further 5 minutes until the prawns are just cooked. 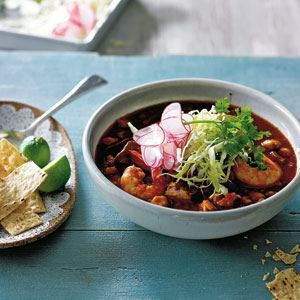 Serve the pozole with finely sliced radishes, shredded cabbage, coriander sprigs, lime halves and corn chips. Heat the oil in a large frying pan over medium–high heat. Season the pork with salt, then sear for 5 minutes until browned. Remove and set aside. Add the garlic and onion to the pan and cook for 5 minutes until softened. Turn off the heat. Put the hominy into a large saucepan with the pork, garlic, onion, tomatoes, stock, chillies and oregano. Bring to the boil, then reduce the heat to a simmer and cook for 1 1/2 hours until the pork and corn are tender. Add the prawns, lime zest and juice and cook for a further 5 minutes until the prawns are just cooked. Season to taste with salt and pepper. If you’re lucky enough to find pre-treated, ready-to-cook hominy at a specialist food shop or Mexican deli, boil 200 g (1/2 cup) for 2 1/2 – 3 hours until the kernels are tender, and then proceed with the recipe. Otherwise, use tinned hominy, or even white beans. If you have trouble getting your hands on chipotle chillies in adobo (they are usually sold in small tins), their smoky flavour can be approximated by using a mix of smoked paprika and chilli flakes. Credits: Recipes and images from Whole Food Slow Cooked from Olivia Andrews, published by Murdoch Books. 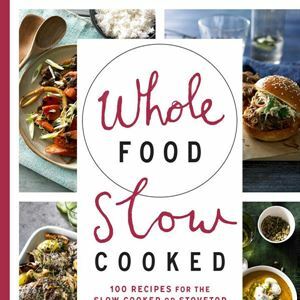 Photo Credits: Recipes and images from Whole Food Slow Cooked from Olivia Andrews, published by Murdoch Books.